This recipe makes indulgent, fudgy brownies that are studded with extra chocolate chips for added decadence. 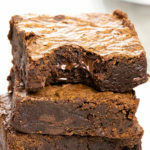 This foolproof recipe for Easy Chocolate Brownies makes a dark chocolate fudge brownie that’s dense, gooey and decadent. These are a triple chocolate treat that’s made with dark chocolate, cocoa powder and chocolate chips, making them one indulgent dessert! 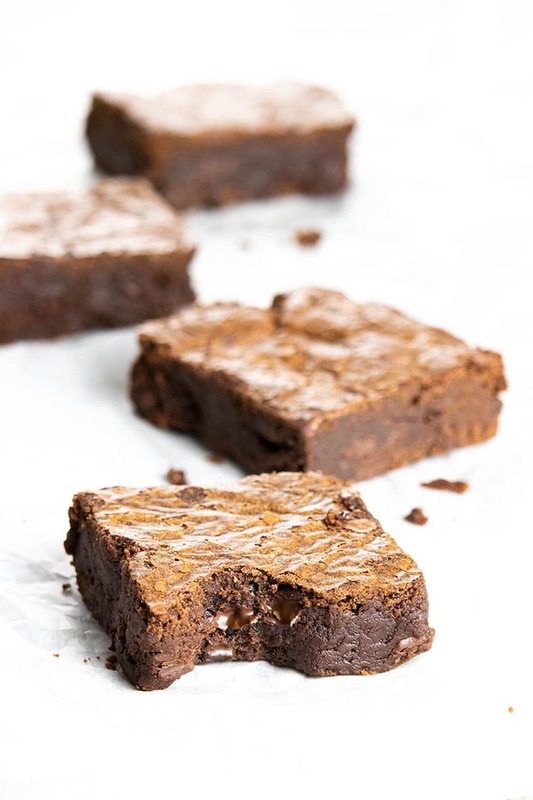 The smaller amounts of flour and no leavening agents give these brownies their extra fudgy texture. The addition of brown sugar instead of all white sugar cuts down the sweetness and adds to the rich chocolate taste. Melting the butter rather than creaming it with the sugar creates a denser, softer brownie. The addition of egg yolks, as well as whole eggs, give the extra gooey consistency. The combination of melted dark chocolate and cocoa powder rounds out the flavor and texture for a satisfyingly chewy result. These Chocolate Fudge Brownies are ultra thick, with the perfect balance of fudgy, chewy, and chocolaty goodness. 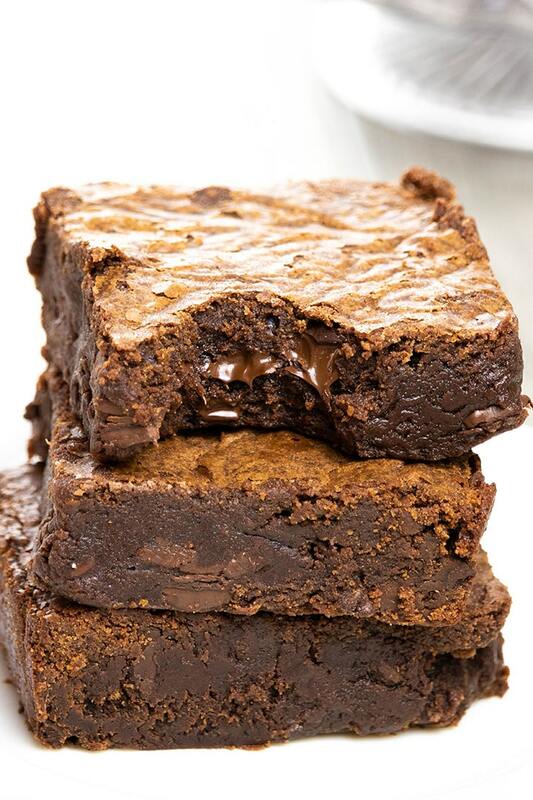 Oh, and that iconic crinkly crust on top – what’s a brownie without it? This recipe is mixed up in one pot (yes, I make them in a pot) so they are super easy with very little mess! Cut the butter into even sized cubes and add them to a large saucepan. Melt the and butter over medium heat, stirring until melted. Add the chocolate to the warm butter. 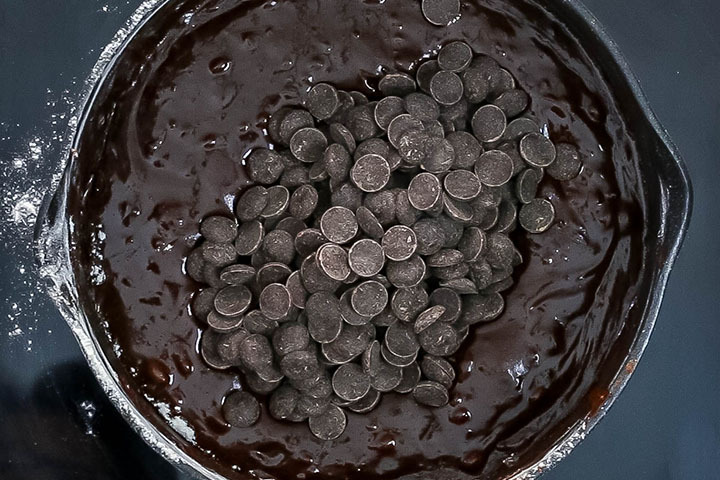 Stir until the chocolate is melted and smooth. Add the sugar. Followed by the brown sugar. Mix to combine. 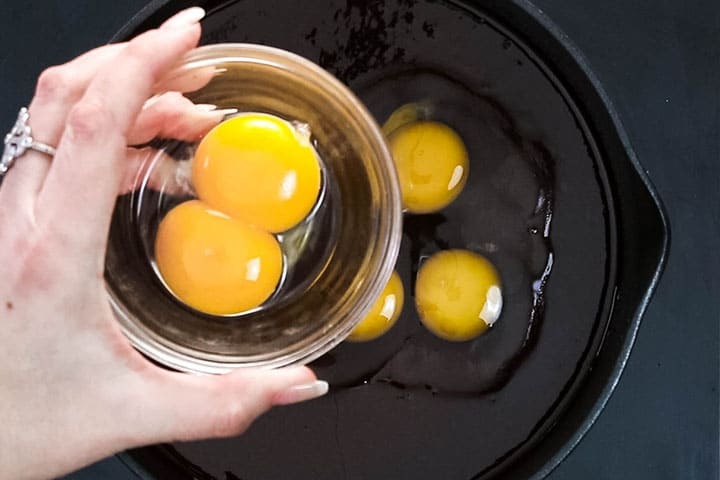 Add vanilla, salt, three eggs, and two egg yolks. Stir until smooth. Sift in the cocoa powder. Followed by the flour. Stir until just combined (being careful not to over mix). A few lumps are fine. Fold in the chocolate chips. Mix to combine and spread evenly into the pan. Bake for 25 -30 minutes. After Baking, 25 minutes gently shake the pan. If the brownies wobble in the middle, the’re not quite done. Bake for five more minutes, and test again until. Repeat until they don’t wobble, the top has a shiny, papery crust and the sides are just beginning to come away from the pan. Allow to set before slicing (try anyway). Serve and enjoy. These Brownies are so addictive you’ll want to make a second batch before the first is finished! Use premium ingredients. Using quality ingredients in a recipe is vital if you want great results. It makes a massive difference in taste. Take care in measuring. Measure carefully and accurately. It’s key to getting the best results from a recipe. Use room temperature eggs. Eggs combine easier when mixing at room temperature and mix more evenly into the batter. Your brownies will have a lighter texture and cook more evenly. To quickly warm your eggs: Just set them in a bowl of warm water for 10 – 15 minutes. This will allow them to warm all the way through. Mix by hand. For fudgy brownies, always mix by hand. You can use a whisk until adding the cocoa powder and flour and then switch to a wooden spoon. Don’t over mix. When mixing in the flour only mix until combined. A few lumps are fine. 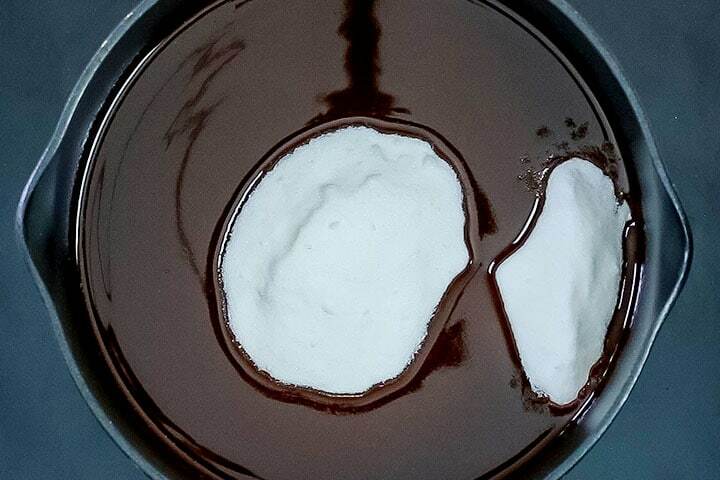 Over mixing creates a cake like brownie. How do you Store Brownies? 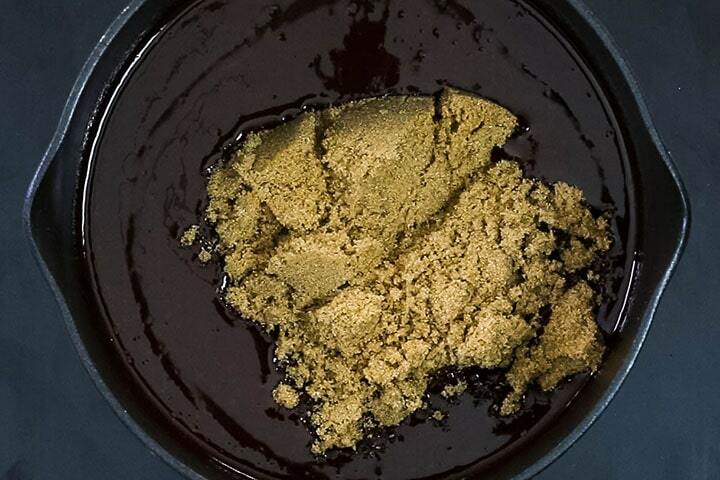 Store brownies in an airtight container for up to 4 days. Better yet, I use this pan which comes with a lid for easy storage. How do you freeze Brownies? To freeze brownies, cool them completely, but do not slice. Wrap the brownies tightly with plastic wrap, then wrap them again with foil. Freeze them for up to 3 months. 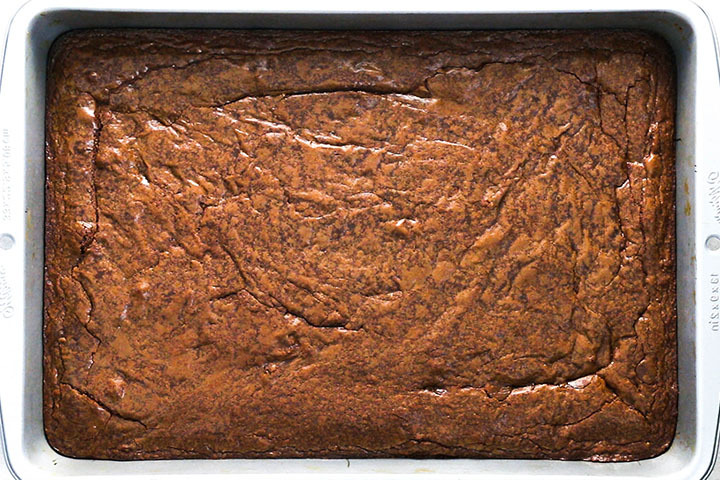 When ready to serve, thaw the brownies at room temperature before cutting into individual slices. Melt the and butter in a large saucepan over medium-low heat, stirring until melted. 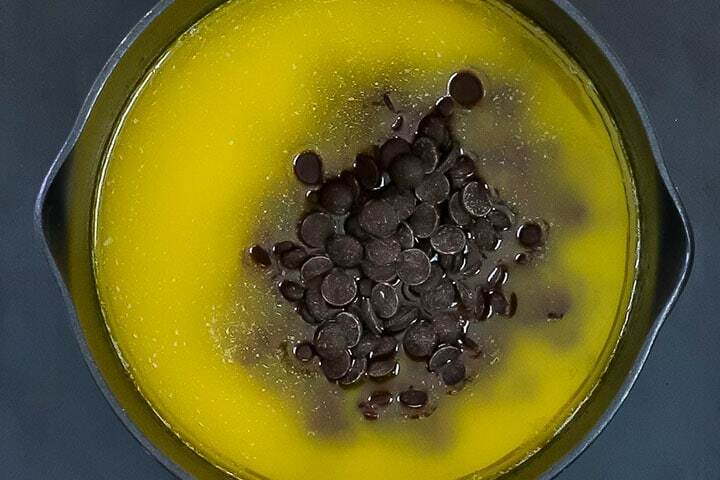 Remove from heat and stir in the chopped chocolate until it's melted and smooth. Stir in the sugar and brown sugar right into the pot. Whisk in the eggs & egg yolks one at a time, then the vanilla & salt. With a wooden spoon, stir in the flour and cocoa powder until evenly combined. Fold in the chocolate chips. Spread into the pan. place the pan in the oven and set your timer for 25 minutes. When the timer goes off, open the oven, pull the shelf out and gently shake the pan. If the brownie wobbles in the middle, it’s not quite done so slide it back in and bake for another 5 minutes until the top has a shiny, papery crust and the sides are just beginning to come away from the pan. 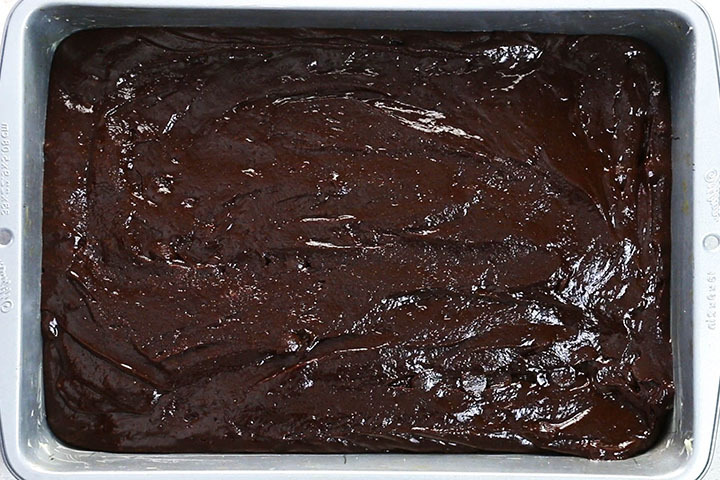 Remove from the oven and cool the brownies for at least an hour before removing from the pan and slicing. To quickly warm your eggs: Just set them in a bowl of warm water for 10 - 15 minutes. This will allow them to warm all the way through. Update Notes: This post was originally posted in 2015, but was rewritten and republished with new photos a video, step by step instructions and tips in February of 2019. You can sign up for the subscription list just above the recipe.